Dea vivente > Фотографии > Art photography > The Morning Star is shining! The Morning Star is shining! Meet the new Dea Vivente girl, she is called Zaria Danica! This name and image were thought up by her future owner, and Zaria will come home to Scotland very soon. Her owner has come up to the process of choosing the doll’s name and character so thoroughly even before her creation, and I was so pleased with that! Zaria Danica (Zaria – “dawn”, Danica – “star” – the names of the goddess Zaria in Slavic mythology) – The Dawn Star, the goddess of sunrise, beauty and love. Zaria Danica, as she was thought of, has a ‘morning’ look: she is a light and tender and a bit cold beauty with bright blue eyes and shining gaze! You can look at studio photos of the doll in this gallery. I had been shooting her all day long before I stopped when it was dark outside in the window. For this photo session I was selecting very light tones which could suit the dawn goddess’s nature best. Also I was missing art photoshoot, so I have experimented a bit in this direction. I’ve taken several art-photos, and here is one of them where Zaria Danica indeed appears to us as a dawning star in the soft light of the morning! Among art-photos there is also a conceptual one named “Silence”, I’ve come up with visual idea for this picture about a year ago, and Zaria Danica appeared to be an appropriate model – I’ve succeeded to get the desirable effect with her. Two more art-photos can be seen in this gallery. And now about working aspects – I’ve prepared the colour and type chart for the hair that can be chosen when ordering a doll. It presents available locks as they are, also shown together with a doll’s face. This mini-catalogue of locks will help future owners to match desirable hair for the wig and ease its choice. 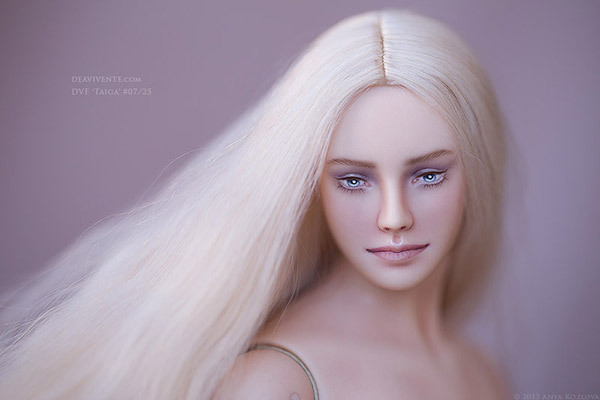 Over time samples of other options will appear – skin tone, make-up, eyes, etc. As I’ve spoken about before, I’ll make the next Dea Vivente Familia doll by my own taste and for the visualization of several unreleased options, as well as probably some new ones.